HÀ NỘI — Vinsmart, a member of the property and retail conglomerate Vingroup JSC, and the leading Spanish technology firm BQ on Thursday signed a strategic partnership agreement to promote the production of smartphones branded Vsmart in accordance with international standards. Under the agreement, BQ will sell intellectual property rights to Vinsmart in order to develop two Vsmart brand name smartphone products for the high-end and mid-range markets. This is an important step for VinSmart to soon launch Vietnamese-branded smartphones with future-oriented design and European-standard technology. In addition, VinSmart will exploit BQ’s strengths in almost all aspects of the value chain of producing smart electronics from design, research and development to production. VinSmart will also work closely with BQ on product research and development to apply the world’s most advanced technologies to the smart electronics manufacturing. Currently, BQ is cooperating with many prestigious technology partners around the world such as Qualcomm, Google and Spanish universities to research and develop products and deploy production, thereby bringing the world’s modern technologies to Vsmart products. Speaking at the signing ceremony, Vinsmart’s general director Nguyễn Mai Hoa said that VinSmart’s collaboration with leading European technology company BQ, just three weeks after announcing the launch of Vsmart smartphone production, demonstrates the determination of Vingroup in its efforts towards knowledge- and science-based production, contributing to the efficiency of Việt Nam’s economy. “We are working with the world’s leading companies, seeking out the best experts and completing the line of equipment to produce phones. Together with VinFast cars, Vsmart phones will contribute to the development of the Vietnamese industry and bring the Vietnamese brand to the world,” Hoa added. 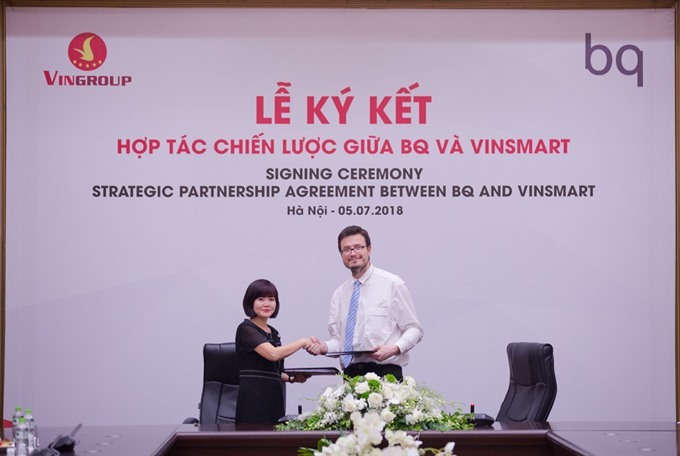 In June 12, Vingroup announced the launch of VinSmart Joint Stock Company with a charter capital of VNĐ3 trillion (US$131 million). VinSmart will operate in two main areas: first, the production of smart electronics and second, researching, experimenting and applying artificial intelligence (AI), automation and new generation materials.